CAR LITTLE THERMOMETER: The excellent helper for you to know temperature when driving, not need of seeing cell phone, ensures can much convenience, much safer driving and update your driving experience. Keeps perfect temperature, can be read easily. 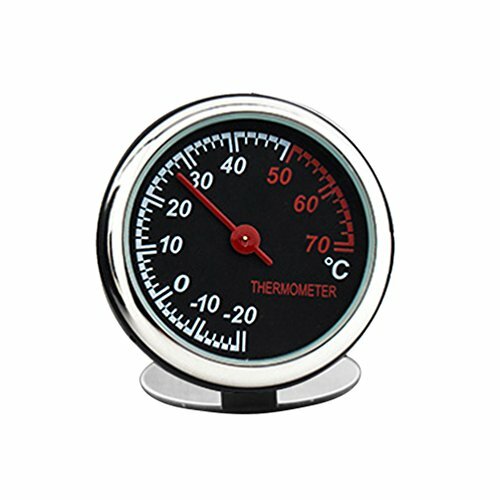 Nice little thermometer, can use as an car accessory, increase the sense of car luxury. Suitable for most of cars, make your driving life more happy. Also suitable for most of the life scenes, can install in your car, home, office, ect. With double-sided tape and metal base, can stick it on any surface, place you like, also can use the chip to fix it on the car air vent. Small Car Thermometer is made of steel movement, glass mirror surface, ABS shell, safety, durability, high capacity. Very convenient to use, bring you a better experience, is a great car accessory. If you have any questions about this product by idain, contact us by completing and submitting the form below. If you are looking for a specif part number, please include it with your message.